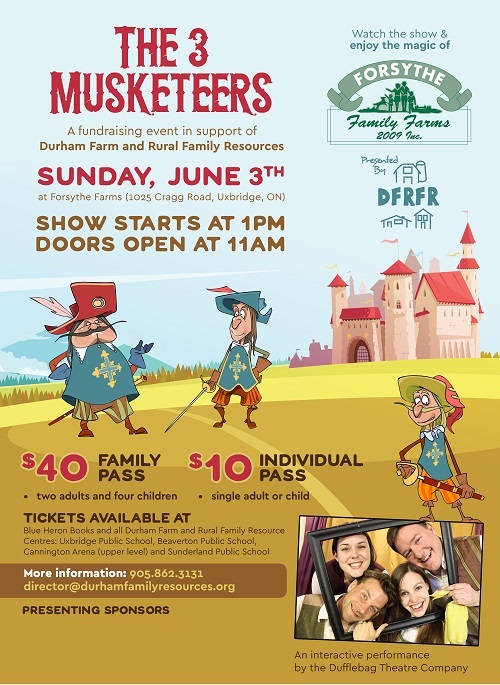 Durham Farm and Rural Family Resources presents: The Three Musketeers at Forsythe Family Farms. Doors to the farm open at 11am with the show beginning at 1:00pm. Ticket holders will have access to the farm including hay rides, playground and barn. A fundraising event in support of Durham Farm and Rural Resources. An interactive performance of The Three Musketeers by Dufflebag Theatre Company. Appropriate for children of all ages and families. Tickets are: $40.00 for family, which includes any two adults and up to four children or $10.00 inidividual ticket price. All ticket prices include taxes and ticket fees.